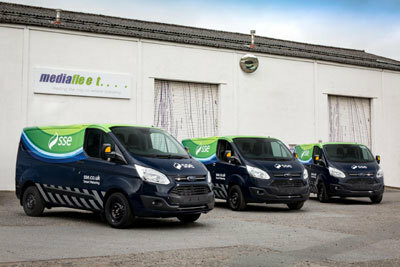 Leading British energy supplier SSE has switched on to the Ford Transit Custom as the preferred workhorse for its army of smart meter installers, with 507 specially equipped examples joining SSE’s fleet. The first of the strikingly liveried Transit Customs are already hitting the road as part of SSE’s nationwide smart meter roll-out programme. SSE’s Transit Customs are equipped with the powerful yet economical 2.0-litre 130PS Ford EcoBlue TDCi engine with Auto-Stop-Start technology. They are fitted with internal storage and racking systems at Qi Van Systems of Telford, Shropshire, and liveried at Mediafleet of Witney, Oxfordshire. Following its introduction in 2012 the Transit Custom established itself as Ford’s top-selling commercial vehicle in the UK and across Europe. Last year’s total European sales of Transit Custom stood at 118,000, a 15 per cent increase over the previous year’s record figure. More than 50,000 Transit Customs were sold in the UK last year, pushing total Transit registrations here, including Courier, Connect and the two-tonne Transit, to over 100,000. Later this year a plug-in hybrid electric vehicle (PHEV) version of the Transit Custom will be delivered to 20 test fleets, with an emission-free range of over 30 miles and award winning Ford 1.0-litre petrol engine as a range extender.